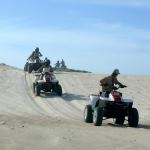 Discover Aruba's landscape on a fully automatic ATV (All Terrain Vehicle or quads). It's excited! ATV Tours are suitable for experienced as well as inexperienced drivers. All you need to ride an ATV is normal driver's license and older than 21 years old. Eagle Bowling Palace is a modern 16-HPL lanes bowling alley, featuring a cocktail lounge and snack bar. Palm Beach Dream Bowl has 8 state of the art bowl lanes, a huge modern sports bar, the latest arcade games in the area anbilliard tables. is a 18 hole, par-71 course, designed by Robert Trent Jones II. is a 9 hole golf course surrounded by luxury vacation villas. 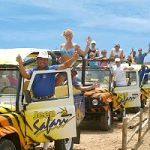 Explore Aruba and get the most for your money with an ABC Jeep Safari. Your half or full day action adventure starts with free pick-up service and a warm welcome from your friendly guide. Then 6 of you hop into your open Land Rover Defender jeep for the most fun you've ever had while driving. Enjoy great extras that you won't find anywhere else; a hot lunch and unlimited drinks while non-stop jokes keep you in stitches. There are over 350km of Mountainbike trails on the Island including great and challenging single trails! Bring your click pedals (and shoes) and Rancho Notorious will put them on the bike for you. They have helmets available for you, but of course you may bring your own too. It's time to Salsa! Discover the rhythm of the island and dance like the locals do! Sign up today and let us teach you Salsa, the most popular dance in the Caribbean... and more! Diving in Aruba is famous for the spectacular shipwrecks and interesting coral formations that dominate Aruba's underwater realm. This includes the 400 foot Antilla wreck - the largest wreck in the Caribbean. Most of Aruba's dive sites lie along the protected western and southern coasts, a short distance from the hotels on Palm Beach. Aruba's waters are rich in exotic marine life, including stingrays, moray eels, manta rays, barracudas and yellow tail. What more can you say about shopping in Aruba except that it's bounteous and you can max out any number of credit cards in a short afternoon? Note that shopping in Aruba is not precisely duty-free. Only the airport departure lounge shops are technically duty-free. The rest of the shops on the island do offer discounts on some items, as much as 25%, but do some comparative shopping before plunging into big-ticket purchases. In Aruba you can bask on the beach with your friend or head out to enjoy world famous high winds of the Caribbean Sea. There is no more perfect place to windsurf or to kitesurf. World famous instructors and specialty shops are at your beck and call. If you are a wind- or kitesurfer, Aruba is the perfect place to be.